World oil and gas pipe demand will rise 5.3 percent annually to 51.8 million metric tons in 2017 as high oil prices and growing energy demand spur new development. Gas pipe will grow at nearly four times the rate of oil pipe demand. Central and South America and the Asia/Pacific region will grow the fastest. 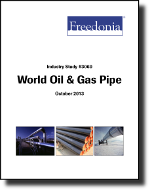 This study analyzes the 40.1 million metric ton world oil and gas pipe industry. It presents historical demand data for 2002, 2007 and 2012, and forecasts for 2017 and 2022 by market (oil pipe, gas pipe), product (e.g., welded steel pipe, seamless steel pipe, plastic pipe), application (OCTG, line pipe, distribution), world region, and for 23 countries. The study also considers market environment factors, details industry structure, evaluates company market share and profiles 38 industry participants, including Tenaris, TMK and Vallourec.